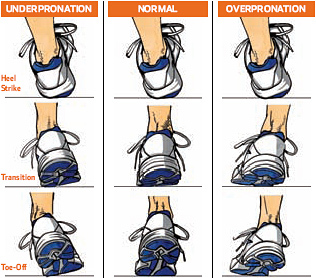 In the last post we discussed how to assess your foot type in static positions. Knowing your static foot type gives you a good place to start, but you really want to be choosing your footwear based on the dynamic support it can provide for your athletic activities. However, for a true dynamic assessment you should seek the help of a trained individual. Hopefully this post will give you some useful information to help you understand more about your possible dynamic foot type. Remember this is a CONTINUUM and an oversimplification. Film Yourself Running on a Treadmill – Of course a 30 sec clip of a quick jog won’t provide the most accurate assessment of how your running gait, but may show some possible tendencies. A proper gait analysis involving the whole body from various positions would be required to truly assess for foot type and preferred footwear. Chris Johnson has a great post and video of someone who dynamically pronates (“runner’s wobble”). This picture shoes an oversimplification of what a video analysis of running gait may show at the foot and ankle. Having an idea of your static and dynamic foot type will give you a better idea of what type of shoe is best for you. Again, it’s best to get a professionals opinion, especially if you are experiencing injuries or pain. But hopefully these last 2 posts will provide some information to help you understand your foot type. The next post will deal with the types of shoes available and how they correlate with foot type. While this blog post series may provide some helpful knowledge, it should be known that static foot posture and selecting shoes based off of this foot type is not the best option. For more information please read this article on pathomechanics and refer to the GaitGuys for the most up to date information on shoes, feet, and gait.